Conference notes that despite the hard work of so many of our activists throughout the United Kingdom – many of whom went out on the ‘doorstep’ for Labour during the general election campaign – we were unable to get the change in government so many of us wanted and we are now stuck with the Tories for another 5 years! We know that this Tory government is no friend to the trade union movement. Indeed it is already driving through a new Trade Union Bill, which is a direct attack on workers’ rights and on our links with the Labour Party. They also plan to abolish the Human Rights Act and are reviewing the Freedom of Information Act. The Tories ideological attacks don’t stop there – they are committed to shrinking the state and we now face further savage cuts to our jobs. They are weakening our workplace rights and terms and conditions and potentially causing the destruction of the public sector. Cameron wants to finish the job Thatcher started and break the unions. 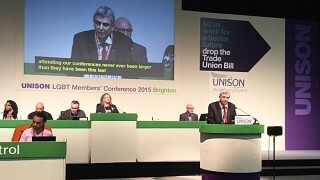 Conference believes that organising is at the heart of our union. Never has there been a more important time to be a member of a union. We need to continue to build our strength. There are still too many workers – including lesbian, gay, bisexual and transgender (LGBT) workers – not in a trade union. We need to recruit these workers and we need to improve our density in our workplaces so that we are in the best position to fight and oppose the Tory attacks. There is strength in numbers – and we need to build and organise in order to defend our members effectively. We also need to recruit and mobilise new activists, we need to encourage membership and participation in LGBT self-organisation as well as across the whole union. 8. Promote opportunities to publicise UNISON and the importance of being in a trade union.